30 August 2017: President of Kyrgyzstan Almazbek Atambayev opens Bishkek Combined Heat and Power Plant. Source: President.kg. However, several months later it was the residents of Bishkek who were left without heating. On 26 January 2018, during a period of unusually hard frosts, an accident at the CHP plant led to a four-day breakdown of its heating system. Kyrgyzstan’s freezing MPs kicked up a stink, demanded that the culprits be put behind bars and took themselves en masse to the CHP plant to discover why the boilers had packed up. The then Prime Minister Sapar Isakov fired a series of officials and rank and file specialists, on the grounds that they hadn’t made the necessary preparations for winter. After the power plant’s director Nurlan Omurkul uulu was fired from his job, he stated that the cause of the accident wasn’t any carelessness on the part of the specialists, but the siphoning off of funds allocated to the rebuilding project. According to Omurkul uulu, the real cost of the modernisation wasn’t $386 million, but $100 million less. “About 90% of the necessary materials and equipment were bought at an elevated price,” Omurkul uulu told a press conference. At the time of the scandal, copies of purchase receipts for various items of expenditure appeared on social media, showing that TBEA, the Chinese contractors, were buying fire extinguishers at $1600 each and pliers at $320, as well as spending $6 million on consultancy fees and $14 million on administrative expenses. The press office of Power Stations, the company that runs the CHP plant, did not deny the accuracy of these figures and called the cost of the project “reasonable”. Meanwhile, after three months of investigation, the Provisional Parliamentary Deputies’ Commission produced a 35 page report (Open Democracy holds a copy) on the scandal. Its main finding was that the contract with TBEA was concluded on disadvantageous terms for the country, and its conclusion covered in detail the causes of the accident and the losses incurred through the credit arrangements. Kyrgyzstan received a loan at 2% per annum over 20 years, but also has had to pay commission on the management of the loan at 0.18%. Its total repayment cost comes to almost $470 million. The conclusion notes that since 1961, the Bishkek CHP plant has had 24 boiler units with 11 turbines producing 512 megawatts (MW) of power and 994.2 Gigacalories (Gcal) of heat. The units use only demineralised water produced by a special plant. Over time, a large part of the CHP plant has deteriorated, and eight of the boilers have been decommissioned and demolished. TBEA has meanwhile built two new, more efficient replacement boilers and a similar number of turbines, each capable of producing 812 MW of power and 1294.2 Gcal of heat. Looking at the copy of the contract concluded between Power Stations and TBEA (a copy of which is held by Open Democracy), it becomes clear that the Chinese company was supposed to build a new chemical plant to produce the demineralised water for the updated boiler units. On the day of the accident, there were nine boilers in operation at the CHP plant, but six of them had to shut down for lack of water. Plant staff began refilling them by hand, but it takes two and a half hours to get one unit back in operation. And while the workers were trying to reboot the system bit by bit, the water stood motionless. Eventually, the 30-degree frost turned half of the plant into an ice rink. The Kyrgyz parliamentarians investigating the accident agree that Bishkek needed its CHP plant to be modernised. According to Commission member Iskhak Masaliyev, since the modernisation, 50% of the CHP plant’s fuel has been local coal, meaning that Kyrgyzstan is buying 50% less Kazakh coal, and thus stimulating the local economy. The energy production should theoretically be higher by another 300 megawatts, but Masaliyev tells me that the real problem lies in the exorbitant cost of the project. In early June 2018, after the publication of the parliamentary report, ex-PM Sapar Isakov, ex-mayor of Bishkek Kubanychbek Kulmatov, MP Osmonbek Artykbayev, ex-PM Jantoro Satybaldiyev, the former director of Power Stations Salaydin Avazov, as well as a representative of the Chinese contractor and other people implicated in the scandal – 30 people in all – were remanded at Kyrgyzstan’s National Security Committee’s pre-trial custody facility. 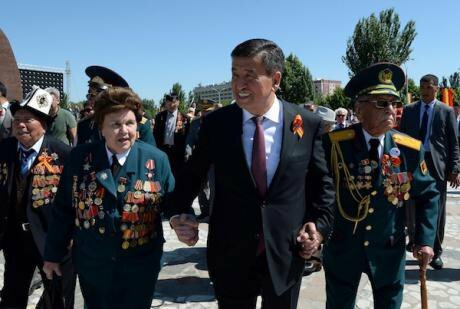 Current President of Kyrgyzstan Sooronbay Jeyenbekov, Victory Day 2018. (c) Xinhua/Xinhua News Agency/PA Images. All rights reserved. 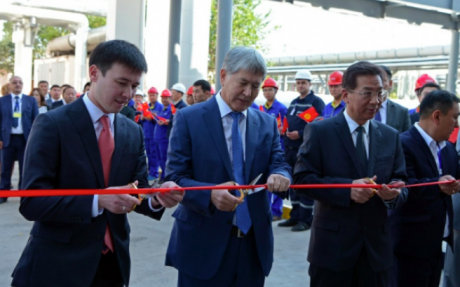 According to the investigators, in 2013 Osmonbek Artykbayev, the then Minister of Energy and Industry, decided to conclude a disadvantageous contract with the Chinese firm TBEA on the conditions it offered. And neither his deputies nor the CEO of Power Stations “demanded the required techno-economic feasibility study and other documents”. The prosecutor’s office also notes that contractor was only chosen after President Atambayev instructed Artykbayev, in writing, to consider Sapar Isakov’s proposal to begin talks with TBEA on 24 May 2013. The investigators state that, during the tender process, Isakov and his second-in command wrote a note to the president advising him to instruct Kyrgyzstan’s Ministry of Energy to hold talks with TBEA over a reduction in the proposed cost. The Kyrgyz government had to choose a contractor from among four companies, and TBEA won the bid. For the Prosecutor’s Office, Isakov’s actions while he was part of the presidential apparatus amount to lobbying for a foreign company. Isakov has been charged with corruption, and Jantoro Satybaldiyev, another former PM, is suspected of being complicit in his crime. Kubanychbek Kulmatov is also suspected, while mayor of Bishkek, of illegally using two million dollars of grant money allocated to the modernisation project to build two new schools. Sapar Isakov does not agree with the accusations made against him, and called his arrest “lawlessness”. “Now I will work with my legal counsel closely and prove my innocence. But I will say that this is complete lawlessness. I’m in shock from all of this,” Isakov said to journalists immediately after his interrogation by the National Security Service on 29 May this year. The Chinese contractors began their work in June 2014. According to the company’s report given to Kyrgyzstan’s National Audit Chamber (which Open Democracy holds a copy of), TBEA spent the allocated funds gradually – the reconstruction took place more or less in three stages. The report says that the first stage was ensuring “the reliable performance of the remaining CHP installations” (although this phrase wasn’t further explained); $9.163 million was spent on this stage. The second stage was the demolition of installations and equipment requiring reconstruction (at the cost of $18.336 million); the third stage, the construction and assembly of the new installations and equipment, cost $358.5 million. Nurlan Omurkul uulu, the former director of the Bishkek CHP plant, shocked the public by revealing detailed breakdowns of various expenses: small items such as pliers, for example, cost $320 dollars. Andrey Voropayev, the newly appointed director of the CHP plant, brought these very pliers to a session of parliament – the equipment in question turned out to consist of a set of several tools. But MPs complained that you could buy these kits at the market for $40. 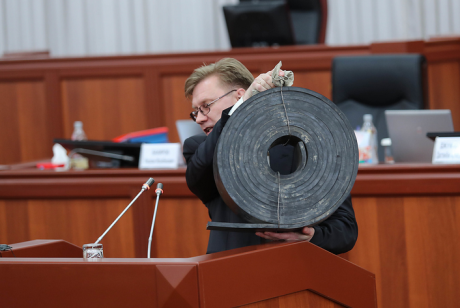 At that point, Voropayev produced an enormous roll of rubber belt track and said that this was also included in the price, but the parliamentarians were not impressed. Furniture costs presented by TBEA. Source: 24 Information Agency. The contractors made yet another interesting purchase: 128 CCTV cameras for a video surveillance system came to $1.7 million. But a CHP plant representative quickly explained their huge cost by telling the MPs that eight out of the 128 cameras were heat resistant and would be installed within the boiler units. The construction company’s executives met up to begin their work, sitting on swivel chairs, and the 24 news agency published information to the effect that they cost 200 dollars each, and standard chairs 130 dollars each. The complete furniture bill came to $200,000. The parliamentarians’ investigation also revealed a discrepancy between data from the CHP plant and the Customs Service. The CHP plant said that the project included the acquisition of duty-free materials and equipment to the tune of $170,737,744, while the Customs Service presented a figure of $169,940,177. This information suggests that there could have been improper use of funds during the reconstruction of the Bishkek CHP. But the question is who benefitted from it in the end. Neither the security services, nor the MPs are in a hurry to come to any conclusion. But many believe that one man alone should carry full responsibility for the collapse of the project. CHP director Andrey Voropayev. Source: Kaktus.media. All rights reserved. I tried to contact Atambayev to find out his opinion concerning the accusations being laid against him, but the press officer of the Social-Democratic Party of Kyrgyzstan, of which Atambayev is chairman, told me that the former president is unavailable for comment. But we can recall what Atambayev said at the SDPK Congress on 31 March this year. He didn’t deny that he initiated the energy projects, although TBEA had a greater role in implementing them. “I gave the order not just for the reconstruction of the CHP plant, but for all my country’s energy projects. [...] And if someone has stolen something, haul them before the courts and put them behind bars,” said Atambayev during a press conference. In his speech, the ex-president proposed laying the blame at current president Sooronbay Jeyenbekov’s door, suggesting that his actions should be examined, as it was Jeenbekov who, as PM, was responsible for preparing the city for winter. While the officials look for the guilty parties in the failed modernisation of the CHP plant, the public in Kyrgyzstan is more concerned about what awaits them this winter. What effort is the present government making to prepare for the cold weather, and will the Chinese finish building the promised chemical plant? I spent three weeks trying to gain access to the CHP plant’s territory to see how far building has progressed, but in the end it's press officer Tagjana Aidaraliyeva refused me entry. CHP director Andrey Voropayev also refused to meet me, citing a full diary. Meanwhile, at a press conference on 12 September 2018, Damir Sagynbayev, the secretary of Kyrgyzstan’s Security Council, stated that five criminal cases had been opened into the modernisation of Bishkek CHP. The harm to the state is calculated in the billions of soms. These cases are expected to go trial in the next month. From the beginning, the project was not open to participation from outside. There was no open tendering. Four companies’ proposals were considered: TBEA, China Machinery Engineering Corporation (CMEC) and “Chjun Khan” from China, and the Russian Inter RAO EES. To discover why the Kyrgyzstan government picked TBEA, you need to start at the beginning: the moment when the contract was signed. In fact, Kyrgyzstan’s law on state procurement requires companies to tender, but its government, citing its law on utilities, which allows large strategic projects to waive that requirement, refused to put the contract out to tender. 1 February 2013: A memorandum of intent to cooperate on electrical power development between the Kyrgyz Power Stations company and the Chinese company TBEA is signed. 4 May 2013: The Secretariat of the Chinese Embassy’s Advisor on Trade and Economic Issues sends a note to Kyrgyzstan’s Energy Ministry recommending TBEA as the only possible contractor among Chinese firms. 24 May 2013: President Almazbek Atambayev directs his Minister of Energy and Industry Artykbayev to consider a letter from Sapar Isakov, asking the Minister to begin talks on lowering the price suggested by TBEA and describes the meeting he held with Tsin Yuilun, China’s trade representative in Kyrgyzstan, who has told Isakov that TBEA might drop its price. 28 May 2013: Artykbayev holds a collective meeting, the minutes of which record that out of the four potential partner companies the Chinese TBEA and the Russian company Inter RAO EES are the most technically and economically advanced. Avazov, who heads the Power Stations company, proposes working with TBEA and his deputy agrees with him. Deputy Energy Minister Kaliyev reminds the meeting that the presidential administration is also in favour of TBEA. The meeting ends with a collective decision: TBEA is the most advantageous option. 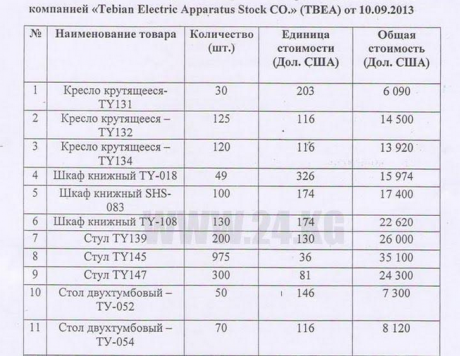 13 June 2013: Kyrgyzstan’s Foreign Ministry forwards a note from the Chinese Embassy to the Power Stations company, annotated, “Most urgent”, where the Chinese diplomats again insist that TBEA is the only possible option as contractor. 8 July 2013: The Kyrgyz government creates an inter-agency committee for talks with TBEA. 16 July 2013: The Power Stations company concludes a $386 million contract with TBEA, for the modernisation of the Bishkek CHP plant. 11 September 2013: Kyrgyzstan’s government signs a credit agreement for the same reconstruction figure with China’s Eximbank. 3 January 2014: Kyrgyzstan’s new law, ratifying the credit agreement passed by parliament and signed by its president, comes into force.